Technically, I suppose this happened last week, but still. It counts. 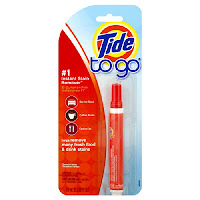 When I had to use the Tide Stain Stick that I packed for Malice Domestic...before I even left the house. Btw, it worked on getting foundation off my white T-shirt.